The 38M Toldi was produced and developed under license from Swedish company AB Landsverk between 1939 and 1942. Only 202 were produced. This was a development of the Strv L-60. Initial tanks were armed with a 20mm gun. 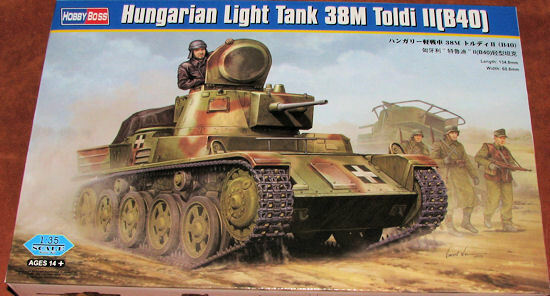 Toldi tanks entered Hungarian service in 1940. They first saw action with the Hungarian Army against Yugoslavia in 1941. These tanks were mostly used against the USSR between 1941-1944. Because of their light armour, armament and good communications equipment, they were mostly used for reconnaissance. The design was no match against Soviet T-34 medium tanks encountered during the early stages of Operation Barbarossa. Toldi IIa (k.hk. B40) - modification developed in 1942, armed with 40 mm gun - 80 tanks of earlier variant were rearmed this way. Let's get the basics out of the way. Molded in tan and brown plastic, the kit has a separate upper and lower hull onto which all the various bits and the turret are placed. 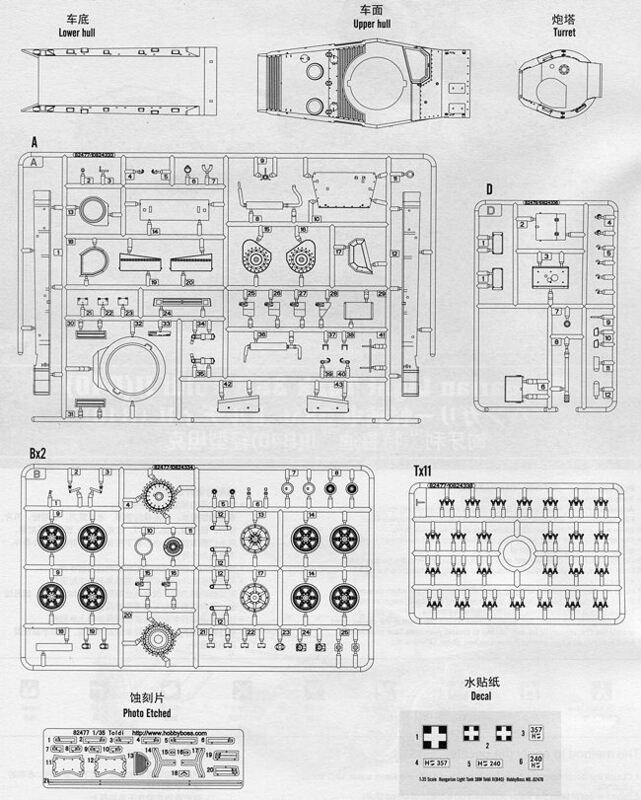 Molding is superb as anyone who has built a Hobby Boss kit can attest. This tank seems to use torsion bar suspension pieces as the main attachments for the road wheels are on 'L' shaped arms. This kit does not have a mass of road wheels, which many will appreciate. What it does have are a lot of individual track links. 125 per side is required and these come on no fewer than eleven sprues, which make up a majority of the parts count. A photo etch fret is included and this is put to good use. Most of the smaller bits are used as fender supports, while there is a screen for the centrally mounted main headlight. The two largish pieces are to be wrapped around a provided form to mold the two fender mounted light shields. The long skinny piece is used for the semi-circular radio wire. I would suggest annealing this fret to make molding easier. The kit's turret is nicely molded with a main hatch and cupola. The main 40mm armament has a coaxial gun. This all notches into the the main upper hull piece when done. The kit is a curbside as the car guys say and so there is no interior or hatch detail. The difference between this and the Toldi I kit is that the C sprue is replaced by a D sprue. Thi s includes all the additional scabbed on armor for the front of the tank and around the gun. There are also armored vision ports for the driver as well as an add on bustle in the back of the turret. Kit markings are limited to decals for the box art tank No information is provided for it in terms of the unit, but it is painted in an overall Sand with green and red-brown camouflage. Instructions are well done with large and easy to follow construction steps. 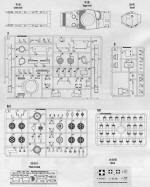 Four overall drawings are provided to let you see how it all fits together. Those who like to model the minor Axis powers will be very pleased with this one. Rarely does one have the opportunity to find well detailed, reasonably priced kits of vehicles like this. I am sure you will be pleased with the results of your build.